Looking to Boost Your Website Sales? Having a productive and profitable website is easy to achieve – said no business owner trying to generate website leads EVER! It does not matter what you are selling, generating more website sales and increasing revenue is all about consistency. Can you imagine doing the same over a over again and not getting any results? You can be consistent with no results. That’s why OPTIMIZATION must be part of that “consistency”. Creating a system that includes constant online optimization is vital. I’m going to share with you today 5 steps to increase your website sales. As business owners, having a plan with realistic goals is the first place to start. Sitting down and defining your goal to increase website sales will set the tone to know how aggressive your campaign will be. Imagine if you set a goal to double your business in 6 months. What tactics are you going to use to reach that goal? What can I realistically achieve in the timeframe allotted? Do I even have a budget? What do I need to delegate? Set goals that will provide you realistic results. When your goals are well defined, results will follow. I know it sounds kind of obvious, but unfortunately, I see so many business owners overwhelming their audience with tons of links, complicated navigation menus, outdated pictures, and even using flash! >> All of these will make your website less productive with zero sales and results. What’s more, sometimes the latest trends for website design can also make your website slow and difficult to navigate. Include your contact information. Surprisingly, many business owners make their audience play scavenger hunt in their website! Your inside pages should follow the same tips listed above. Remember to keep your page clutter free and it will hit a home run with many website leads your way. Whether it is to order your product or service, subscribe to your newsletter, or contact you directly, getting your audience to take action can be tricky. Usually it is because you are asking your audience to do all of the above! Choose 1 goal per page. 1 page = 1 Call to Action. I really don’t have more to say here. I almost forgot! Be creative with your call-to-actions while creating a sense of urgency. The “Buy now” or “Click Here” are things of the past. Yes, I want my [insert-product-name-here]! Yes, I’ll try it for free today! Creating a successful online business takes thinking outside the box. Brainstorming on new online marketing methods and tactics is challenging and fun. 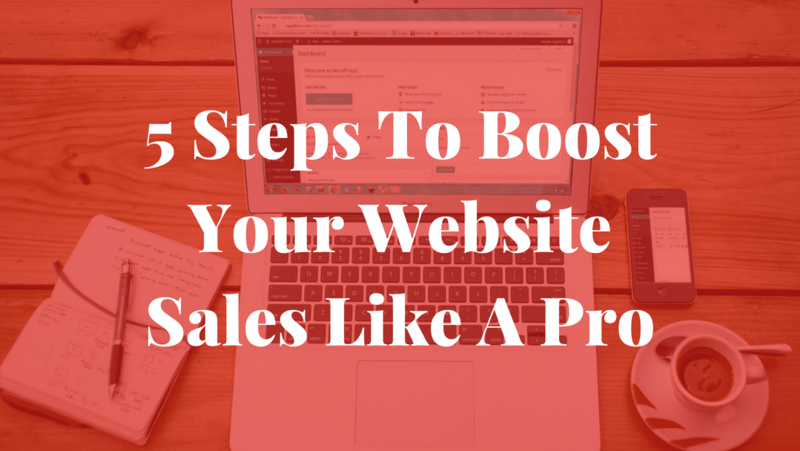 Plus, it can lead to increasing website sales! Don’t be afraid to experiment different tactics as long as you track your results. Tracking your results will allow you to optimize. Remember the beginning of the blog? Consistency is great! But optimization allows you to figure out what works and what doesn’t. For those that tactics that are not generating the desired website leads, tweak them or eliminate them. Sometimes, changing the color or even shape of a call to action button can boost your website sales. In today’s fast-paced world, video has become the dominant medium and a truly effective marketing method. If you don’t like to make videos, hire someone to be the face of your company. If you can’t do that yet, shoot simple videos with images and voice-over. As it turns out, the use of videos on web pages and landing pages have been proven to increase sales, customer acquisition, and engagement. Your customers can learn about your products or services faster, helping them engage and come to a quicker buying decision. In other words, boosting your website sales. Take every step necessary to have high quality, high resolution video, but remember to keep it to-the-point. Rich content is what keeps your customer involved and interested. Remember, you only have 2-5 seconds to grab your customer’s attention. If you don’t, they will click away. Keep your sales message short, sweet and straight to the point showing your audience how your product or service will benefit them. If done correctly, with strong engaging copy, your customer will believe they cannot live without your product or service. When this happens sales will go through the roof! Increasing website sales takes time, effort and a definitive online marketing strategy that works for your particular business. Brainstorming and experimenting with different online sales strategies will help you hone in on what works best for your online business. Generating increased sales and revenue can happen by using every tool available, creating new ones and finding the marketing methods that work for you! What online marketing tactic are you using? Tell us all about it in the comments below! More: How much should you spend on your website? would you be interested in doing a free presentation / workshop where we can invite new startups and other new entrepreneurs interested in e commerce ? you can get clients, myself included. I’ll be delighted to be a speaker. We actually have presented many times at universities and other events. Let’s connect to coordinate. I’ll be sending you an email. What is your take on comment marketing? Comment marketing is often a very underrated strategy but can be very effective if put into place.